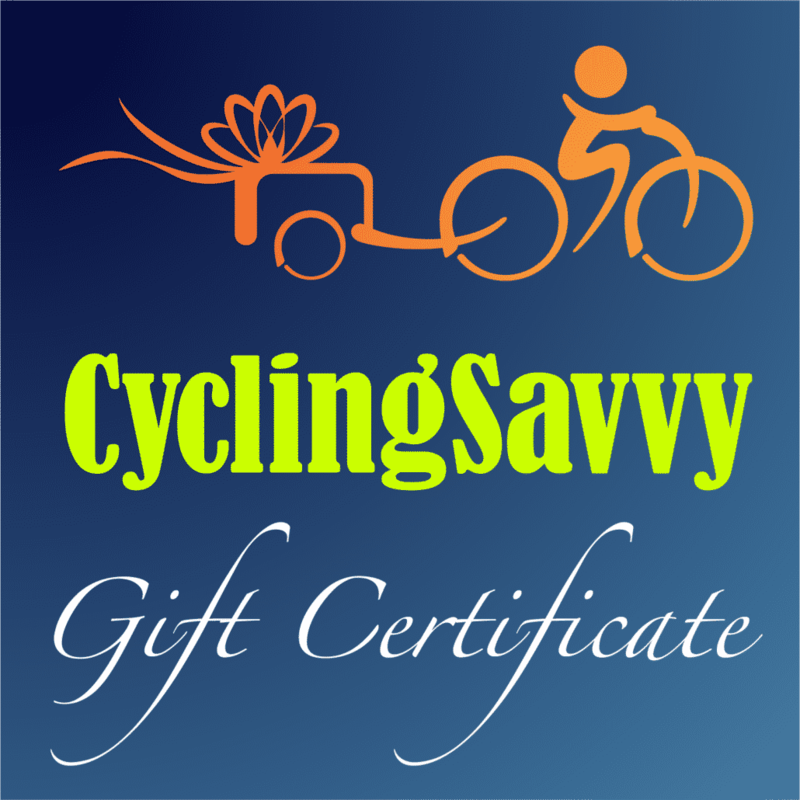 Here at The Savvy Cyclist we prefer to stay away from political matters and stick with the practical. Don’t we all get way too much politics in our lives as it is? A basic appeal of cycling is how it can free us – at least for a while – from the frustrations of everyday life. Freedom and adventure were the key benefits we saw in cycling as kids; the ability to travel well beyond walking distance from home without the help or supervision of our parents. Growing up, cycling was simple. Hop on, wander, explore, discover. In the 1970s – when I grew up – no one was telling me how horribly dangerous cycling was. That’s because it wasn’t. Based on data from the American Community Survey and the National Highway & Traffic Safety Administration, American bicyclists travel about 9 billion miles per year. About 40,000 suffer injury crashes with motorists, and about 750 per year are killed. This means the average bicyclist will travel 225,000 miles between injury crashes, and 12 million miles before a fatal crash. Be a safer-than-average cyclist and those distances increase a great deal. 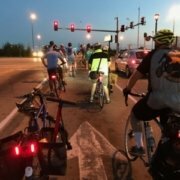 At least half of those deaths involve bicyclists behaving in a very risky manner, such as cycling at night without lights, biking while intoxicated, or darting out mid-block onto a high-speed road. 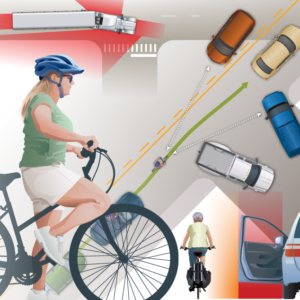 Less than half of the injury crashes involve a law-abiding cyclist traveling along on a roadway. Far fewer crashes involve cyclists who have received formal training. 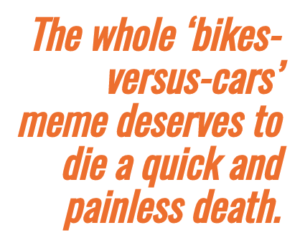 So if you’re a trained law-abiding cyclist, you can confidently bump up those mileages to at least a million miles between motorist-caused serious injury and 30 million miles per death. I’ll leave it to you to figure out how long it would take you to ride a million miles. Yet, to listen to the news, you’d think such personal catastrophes are imminent and inevitable. This myth received an unfortunate boost last week when a terrorist chose a New York City bikeway and the innocent people using it as his target. And so the political realm has imposed upon us once again. The culture expects us to choose sides and stake out our political turf. In the aftermath of this event, some voices have called for still more “protection” for cyclists, by beefing up separation barriers alongside bikeways, and adding posts at path/street intersections. Others are likening the everyday actions of regular motorists – our friends and neighbors – with those of the terrorist. I’d provide links as examples, but I don’t want to expand their audience. Well, I’m not having it. 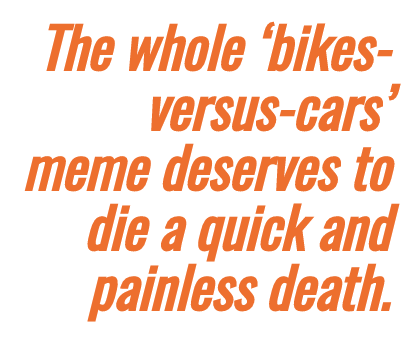 The whole “bikes-versus-cars” meme deserves to die a quick and painless death. To say cyclists and motorists are at war in our streets, and that the government must side with cyclists, will only increase conflict. I wrote about this at length in an essay titled I Am Not a Bicyclist. People who misunderstand Darwin think our primary survival strategy is competition. Eminent biologist E.O. Wilson (no relation) insists it’s really cooperation. Cooperation has made the human race the dominant species on this planet. Cooperation is the fundamental feature of our traffic system, at least when it’s working properly. Cooperation is what we teach in CyclingSavvy. It’s what we experience on a routine basis as we bike around our communities. We need more of it – much more – not less. But barriers inhibit cooperation. And at times they become a hazard in and of themselves. I live in Orlando. Last year we suffered the worst (at the time) mass shooting in modern U.S. history. I was so proud to see how our community came together – gay and straight, all races and ethnicities, all faiths, and those with no faith, all political parties, law enforcement, everyone – to say we will not give in to fear. The community conversation was how do we work together to address the underlying cause of this tragedy, not treat symptoms or point fingers. Not a wall along the border. Not paths with jersey barriers. Not steel posts at path crossings. I’m a human on a bicycle. Are you a human in an automobile? We share an essential need: To understand what the other will do so we can cooperate and make both our journeys better.